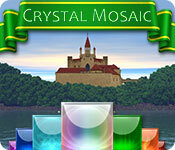 Crystal Mosaic is rated 4.2 out of 5 by 19. Rated 5 out of 5 by jil1 from wonderful!!!! This is really a wonderful game. Gorgeous and pretty. You should give us a present and develop number 2. It would be very fun. Urgent, please! I recommend this game without any doubt. Thank you in advance. Rated 5 out of 5 by crypticsolofawn from Love Mosaic games I love mosaic and time managements games. I play mosaics/griddlers/nanograms to relax. Been a member of Big Fish for years and have turned the music off on All the games I've purchased over the years. This is the first game where I left the music on! If you play to relax, but like a little challenge, this should do it. It is pretty and sounds soothing. 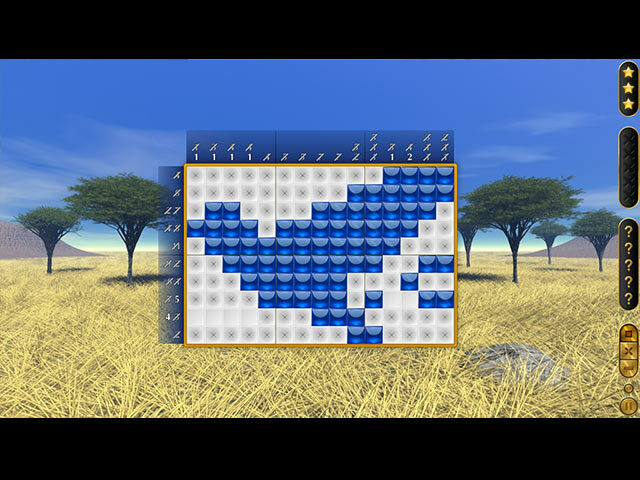 Rated 5 out of 5 by verimeri from Better colors than Fantasy Mosaics This game is a serious contender for best mosaic game created. The colors are amazing- better and brighter than any others. There was only one level I had to use a hint on. The unused squares disappear. That is a great idea that Fantasy does not have. All of the pictures formed by the puzzle are easy to see. I found the puzzles to be quite large enough. Overall I have to say I enjoyed this game maybe even more than the latest Fantasy Mosaics offering. Rated 5 out of 5 by Metiet from Wonderful Mosaic Puzzler! I am really truly enjoying this mosaic. The graphics are lovely, but it is really the puzzles themselves that shine. 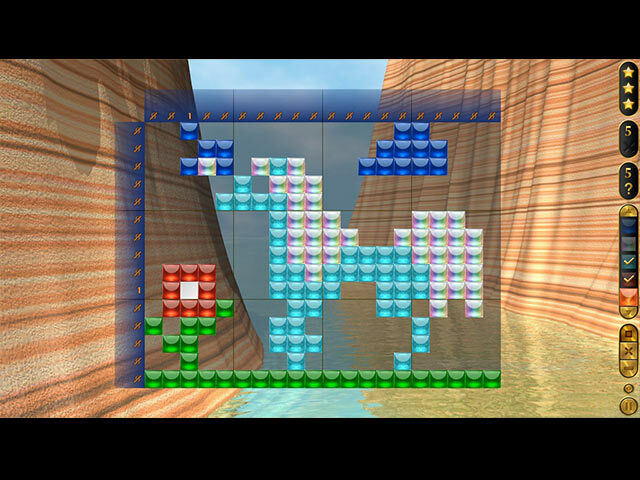 I do miss having an alternate element in the game like how some games let you build or customize something by earning coins as you play through the puzzles, but I haven't enjoyed a mosaic this much since some of the very first ones started coming out on BFG. The game allows you to count with the cursor and then cancel - a huge time saver that many games lack these days. Sometimes I will get to a part in a puzzle and I think, there is no way for me to solve this (as others have mentioned) but if I really get looking I have found they give you enough information to solve everything. Some of the clues are just very suddle and tricky, yet the overall difficulty is not so that you are pulling your hair out. Great game! Hope to see more in the future! 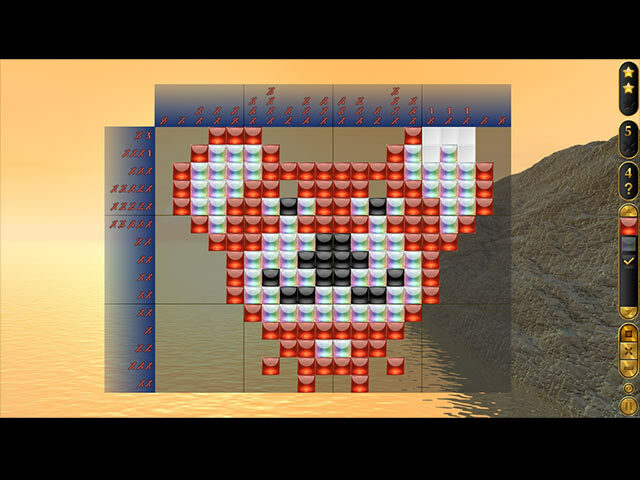 Rated 5 out of 5 by LavenderLion from Lovely mosic game I've only done a few levels so far but really enjoy this game. The music is relaxing the background is nice and the mosaic pieces are beautiful gems. The white is actually a rainbow of colors. Even the black looks shiny and nice. And there are lots of colors. I really like it and bought it right away. I hope this becomes a series! Rated 5 out of 5 by lininindy from BEAUTIFUL COLORS & REFRESHING PUZZLES Was afraid based on reviews...BUT FOUND A GAME TO BUY in the first 30 minutes of play. The tiles are pretty and easy to look at. A refreshing display of colors. The puzzles have a nice background, also easy on the eyes. New puzzle designs. (I was getting bored with the others.) Totally worth purchasing! Rated 5 out of 5 by grandmacathy from There's only 100 levels?? I really love these games. I play them and play them. This game is as enjoyable as others. Yes, I had to fill in the blank spaces but even that didn't bother me as much as usual. There are pretty crystal colors, and at least 3 colors per grid. If you like the mosaic games, you'll love this one too. My only complaint is that I finished it too soon. Rated 5 out of 5 by mnkysmom from Nice Change.. Nice change from the usual mosaic games. Music is wonderfully relaxing. Colors are vibrant and has the addition of an iridescent color tile. Very pretty. It took a minute to get accustomed to the horizontal and vertical markers, as well as the automatic graying of the unused tiles, but overall, a beautiful game. Rated 5 out of 5 by pennmom36 from I'M ON THE FENCE ABOUT PURCHASING THIS GAME Crystal Mosaic has some of the most beautiful crystal tiles, and the music is very pleasing. Each picture is vibrant, and there are so many appealing colors, blues, oranges, reds, greens, even black! (you can however, opt for a traditional Monochrome color option) There are 5 different levels with 20 puzzles in each level, you can earn 3 stars per replayable level, and you can switch between colors in the Colored mode. There are a couple of different options or features that I've never experienced in a griddler game before. For starters, there is a Measuring tool that allows you to measure how many cells are in a row or column, which can be helpful in an oddly shaped puzzle. I was amazed to discover that when I had to exit the game halfway through a puzzle, (to rescue my dog from the cat who thought it was funny to surprise attack him through the rungs of the stairs) (yes my dog needed rescuing from a cat lol) I thought I'd lose my progress and have to redo the puzzle, but the game saved my position! Everything was going great, except for the bully cat incident, until I reached level 10. Perhaps I was having a rough morning, being too distracted, but at the end of the puzzle I had to either guess at the placement of two different single tiles which both had two empty cells, or use a hint, which would subtract a star. There were no more colors to switch to because those were the only two tiles left, leaving me wondering if the entire game would be like this, or just a few here and there?!? I may just wait to buy this until I get another coupon, because it really is a relaxing and beautiful Mosaic Griddler, enjoy! Travel across eight locations while solving color and monochrome griddler puzzles. Earn stars to complete the challenges.